For this Sunday’s pinup tip I’ve chosen something simple, yet so important for vintage fashion wearers. When wearing vintage clothing both reproduction and true vintage sometimes these items may not seem to fit quite as they should, particularly in the bust, and waist, in some cases this may not be due to a sizing issue, but rather due to the undergarments you’re wearing. 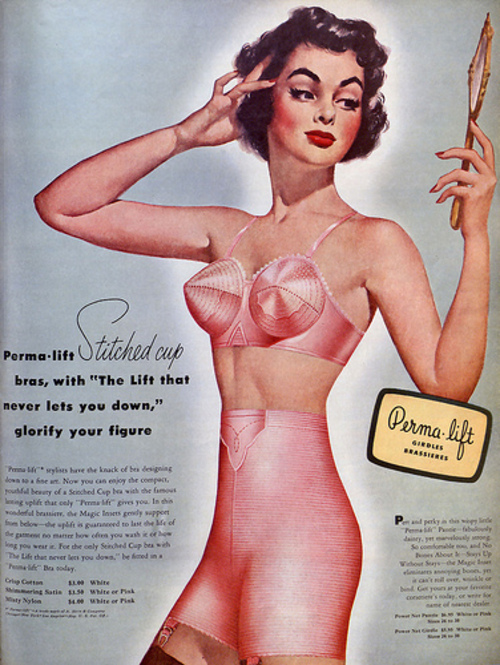 In the 1940’s and 1950’s the silhouette was very different to what we see in modern day fashion, undergarments had a different shape; bullet bras, cinchers, and girdles are all very popular during this period. With even a lot of modern brands like Stop Staring Clothing, the fit of these items can be improved so much by wearing a bullet bra. I definitely recommend adding a few vintage lingerie items to your wardrobe for a more authentic vintage look. True vintage is always a fabulous option. Peach, pink, and white are great colour for an authentic true vintage feel. What Katie Did make very beautiful pieces of vintage inspired lingerie. Vintage lingerie has some sort of magic about them, even though most people won’t be seeing your beautiful garments wearing these items really feel like you fit the part of a glamorous pinup girl. 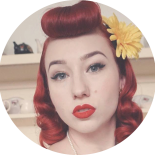 This entry was posted on August 31, 2014 by Miss Lady Lace in Fashion, Pinup and tagged burlesque, Lady Lace, miss lady lace, miss lady lace pinup blog, miss lady lace vintage blog, pinup, pinup girl, pinup lingerie, pinup tip, retro, sunday pinup tip, true vintage, vintage.